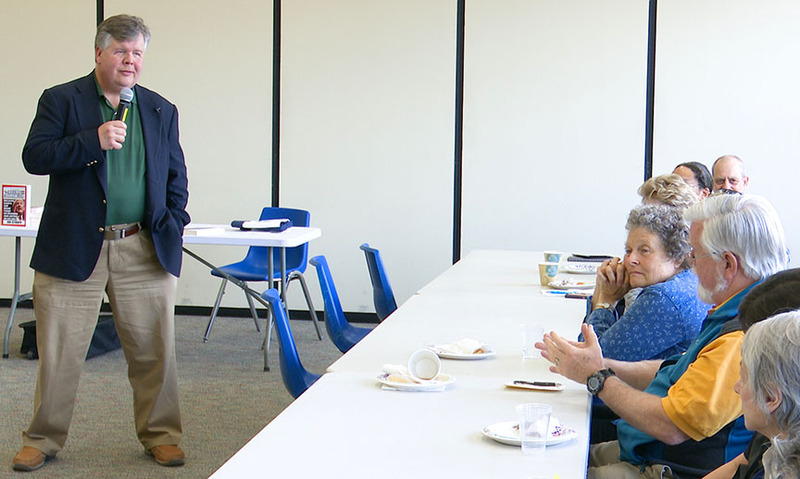 Strupp, a former senior editor at Editor & Publisher magazine, visited Norwalk to promote his book, Killing Journalism: How Greed, Laziness (and Donald Trump) Are Destroying News and How We Can Save It, published by Willow Street Press. Classified ad income, formerly “king” for newspapers, has been lost to Craigslist and similar sites. From 2005 to 2017, there was a loss of more than 14,000 reporter jobs nationwide, Strupp said. Readers don’t want to pay for news they’ve grown accustomed to receiving for free from the web. The current fear of vaccinations and the resultant reemergence of measles can be tied to such web sites, he said. News outlets on the internet have “equal footing,” meaning sites such as The New York Times, The Wall Street Journal and CNN.com are equally accessible as outlets spreading “lies,” such as WND or The Daily Caller. “[P]eople look at something on the web, they think it’s as accurate and credible as anything else on the web, and there’s very little control,” he said. After nationwide cutbacks, readers don’t get enough local news, or the coverage they deserve on issues such as the environment, health care and the reliability of the nation’s power grid. “At this time, when people are in such a rush, right, people jump on their phones, get quick headlines, follow Twitter, they don’t want to sit still for something that’s complicated,” Strupp said. Consolidation of media outlets has also presented a challenge to quality journalism. In 1981, he said, 50 companies owned ninety percent of media outlets. A 2012 report from Business Insider found that six companies now own 90 percent of media outlets. After graduating Brooklyn College with a degree in journalism, Strupp reported for newspapers in New Jersey and California before becoming a senior editor at Editor & Publisher, a trade journal that covered the newspaper industry. He currently works as a freelance writer and teaches writing and media ethics as an adjunct professor at Fairleigh Dickinson and Rutgers universities. Strupp described himself politically as “mostly a moderate” and said he doesn’t talk about President Donald Trump’s politics, but about his opposition to the press. The longtime journalist noted that initially during Trump’s 2016 campaign, the candidate benefited from unedited live coverage of his rallies. But Trump slowly turned against the press, telling audiences not to believe the people behind the cameras. Distrust of the press has grown such that today studies show journalists are held in very low opinion, “somewhere below corrupt lawyers and murderers and rapists,” Strupp said. He criticized broadcast media, particularly cable news networks, for focusing so much coverage on a limited range of issues, such as Trump, natural disasters, and school shootings, and for scheduling so many programs intended to present people’s opinions rather than offer straight news reporting. A bright spot in quality news coverage is the founding of non-profit outlets, Strupp said. Nonprofit news is “a basis to doing it right,” he said, adding that if it were up to him, every news outlet would be nonprofit. He praised the Insititue for Nonprofit News (INN), which counts NancyOnNorwalk as a member. Sounds like it was an interesting talk. However, I am one of the people out there who think far too many journalists and high high brows publications like the NYT and Washington Post, have allowed their standards of fair reporting to decline. They don’t like Trump or anyone in his administration (unless that person doesn’t like Trump too), so they don’t report fully or honestly, they ignore elephants in the room if it doesn’t fit their story line. Journalists may not be ‘the enemy of the people’ but they have become ‘the propagandists for the people’ and I’m not so sure there’s much light between the two. Why isn’t the media calling for the break up of the media monopolies? Why not force these monopolies to fund independent outlets through a fee (tax in other words)? I attended Joe Strupp’s talk. I thought it was excellent and felt that he was very even handed, although based on your description of the NY Times, I suspect you won’t agree. Of course you can watch the video and decide for yourself. One of Joe’s proscriptions is to support independent media, like NancyOnNorwalk.com. Because its focus is Norwalk and hyperlocal news, NoN doesn’t cover Trump or national politics. Still, it seems like there is plenty of partisanship even on the local level. I think that Nancy does the best job she can, and she gets boatloads of complaints from every side when unflattering information is presented. I’m hoping that’s a sign she’s doing it well. What elephants in the room do you feel the NYT has ignored? Good question. I’d bet part of the answer is that the six owners of 90% of outlets would not favor it. I found this talk interesting and engaging — thank you to Cynde Bloom Lahey and the Norwalk Library. If anyone missed it, Harold’s video is great and includes the Q&A. 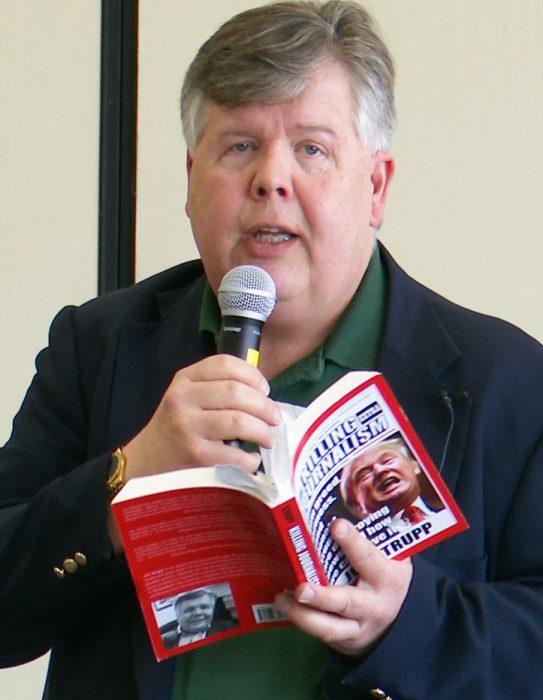 Strupp has been doing author talks since the book was published; one was broadcast on CSPAN. He remarked Saturday that the turnout and book sales in Norwalk were among the strongest he’s seen, and said the audience asked good questions. Norwalkers value journalism, which bodes well for NoN.